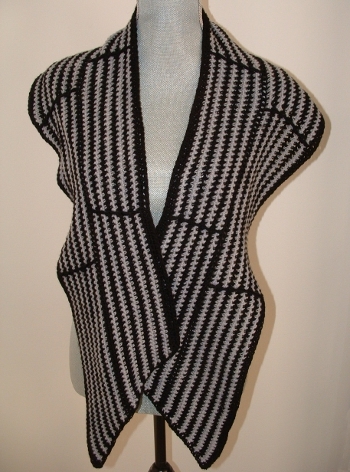 I have always loved the look of Stephen West’s knitting designs. I wanted to take his ideas and translate them into crochet. I contacted him and asked if it would be okay to try and he gave me his blessing to do so. This is my interpretation of his famous Clockwork shawl. I tried to keep it as close as possible to the original knit version, but as we all know, crochet is different than knitting. Instead of using slip stitches, I chose to create the lines dividing the sections with front post double crochets. The striping is achieved with single crochet alternating every other row so there wouldn’t be a bunch of ends to weave in when through. I hope you enjoy this translation! Gauge: Gauge is less important in this design than drape. Choose a hook that will provide the desired thickness to the wrap. If it feels too tight, go up a hook size. If it feels too loose, go down a hook size. Inc 1 = Sc in st at beginning and/or end of section. Start or end the numbered stitches in the same stitch as the increase stitch, i.e. ; sc, sc in same stitch to start the count of 30 in the first section, or work 30 sc and then sc in the last stitch twice as in the last section. These increases will make the slopes along the edges and in the center sections to form the rounded shape during blocking. 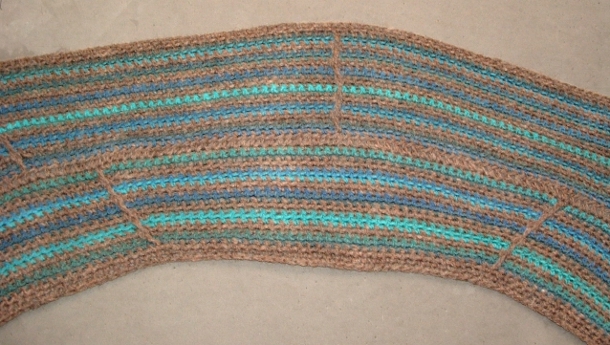 Fpdc = Front post double crochet. Work into the main color row three rows down, or if there is already a post, work around the post three rows down. If you crochet tightly, feel free to make it a treble post to keep the fabric from pulling. It will still look fine! Even rows are ch1, turn work and work back across row in sc. Change color at the end of the row, ch1 and turn. This will set you up for the next row. The only exceptions to this are Rows 22 (center dividing stripe) and Row 46. 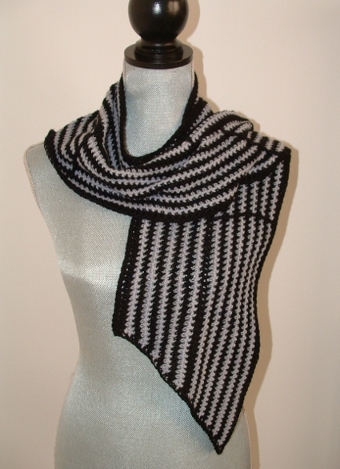 (edging around the whole shawl) Please read the directions in the chart for these 2 rows. The charts are set up to be read from the bottom up, just like it will appear in the hands while working. The first column is the row count, the second column indicates the color (mc= main color, cc=contrast color), the rest are the counts for each individual section with the stitch counts at the end. If you would like to place stitch markers, do so in columns 2, 4, 6, and 8 for the first 22 rows. Place markers in columns 2, 4, 6, 8, and 10 for rows 23- 45. These will be in a different location when you start the second chart! I have highlighted them for you. I’m currently in the process of temporarily moving to New Mexico for my husband’s job. I’m hoping to find new inspiration through the move so I will have some new ideas to share with everyone. I’ll still be a stay-at-home mom with my designing to keep me busy, along with the toddler! Here’s looking forward to many new designs in the future! I’m in the process of making the knitted Clockwork. I’m looking forward to making a crocheted version, too! Thanks for this!